The first shock occurred when I opened WoodCarving magazine, which had been laying on the living room end table for a couple of days. 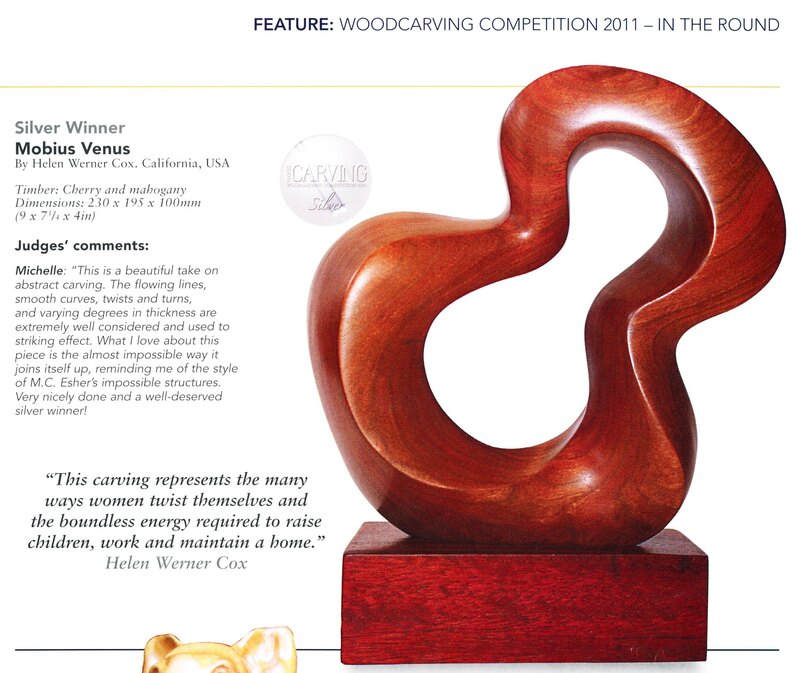 When I got to page three of the magazine, there was a huge image of my very own wood carving illustrating the article about this year’s competition! I was so amazed I got that jolt of electricity in my guts, exclaimed out loud, and slammed the magazine shut, which quite startled my dear husband. Upon further mutual scrutiny we discovered I had actually placed in the competition! What an honor and what an affirmation. The second recent shock was not so much fun. I trucked up to The Huntington last week, armed with canvas and enthusiasm, to find the cactus I had worked on for two weeks, the one featured in my first acrylic painting on site, was gone! I looked away and looked back. Gone. I checked to see if I was in the right spot. Gone. I had that jolt of electricity in my guts, but it did not feel good. I spent three hours, in shock, trying to continue the painting by looking at cactus that were similar to the forms I had drawen on the canvas. Every time I looked up I got disoriented. It was very hard not to take it personally when I looked around and it was the only cactus that was missing in the group. A fellow Artist Guild member happened by and I told him what happened. Shortly after, one of the gardeners made it a point of coming to tell me how it had rotted. It was not until yesterday, when I chanced upon my original drawing, that I realized how much the cactus had changed from the original drawing to the first painting. Then I remembered thinking, as I began the painting, those cactus have moved an awful lot. I will go armed to The Huntington next Tuesday, canvas in hand, ready to adapt, no longer in shock. Onward and forward. Helen, what a thrill that your Mobius Venus placed in the competition! I hope that future well-deserved recognition of your work will come to seem not so much of a shock to you. I wish the magazine image were clear enough for us to be able to read the judges’ comments: would you consider transcribing them for us?